Mr. Pedro T. Balingao resides in Barangay Ragan Norte, in the Municipality of Delfin Albano, Isabela. He grew up in a community where tenant farming is the way of life. The tradition of being a farm laborer is passed from one generation to another. He embraced the tradition and also became one. He now realizes that his seasonal income does not suffice the growing needs of his five children. His income amounting to P150.00 barely covers the basic need of his family. Fate even tested his resilience as his wife went abroad and hasn’t heard from her since. He even incurred debts just to send his wife abroad that in turn left him alone with the burden of paying all these said debts. For five years, he struggled financially and emotionally as a solo parent. Juggling both the role of bringing food on the table and providing maternal care. When Sustainable Livelihood Program (SLP) was introduced in their community, he grabbed the opportunity and became a member of Aquarius SLP Association. Upon receiving the Seed Capital Fund (SCF) amounting to P10, 000.00, he invested it to start his own hollow block manufacturing business. It was his long-time dream to run his own enterprise for him to maximize his skill and earn more. He was able to purchase raw materials such as cement, gravel, sand and the like. He also acquired two units of hollow block moulder. He started producing an average of 400 pieces of hollow blocks per week. Through his perseverance, he effectively utilized his resources and to date doubled his production up to 1,000 pieces of hollow blocks per weekly cycle of production. During the start of his enterprise he earned an average gross income of P3,000.00 per week. Now, his project generates up to P10,000.00 gross income per week which draws an average net income of P5,000.00 per week. It translates to an additional average monthly income of P20,000.00. The enterprise also provided income for others as he hires delivery service earning P1.00 per one hollow block. He now currently operates his own hollow block manufacturing shop. As proof of his hard labor, he was able to generate savings and used it to build a more comfortable house for his children. The steady income helped him send his five children to school and provide them with decent meal. The financial assurance that the project brings sheds hope for his children’s future. As he learned the value of savings in SLP, he now religiously sets aside a portion of his income for future diversification of his project. In his own little way, he gives back to the community by creating employment as he hires delivery service which in turn contributes to the local economic growth. Traces of hardships are visibly seen on the hands of Ms. Iris U. Viola, a sewer and a mother of two. Through the years, countless needles, rolls of threads and yards of fabric were her constant companion to get by. Although she has minimal skill on sewing she strived to make a living out of it since the family’s main source of livelihood is seasonal in nature. She faced difficulty in covering the needs of her family ever since her children entered formal schooling. In times when she couldn’t rely on sewing, she recalled that just to bring home a kilo of rice, she even tried to scavenge roots crops, make a snack out of it and sold it. They don’t own fishing gears to maximize what the sea can offer. Her husband only practices “maki-daklis”, a local term for percentage basis income on fishing. Before the Sustainable Livelihood Program (SLP) was introduced in their community, Ms. Iris’s family had no steady income. They relied on tenant farming as their main source of livelihood, earning a percentage basis income of P3,000.00 a month. She also did occasional sewing as a side line job and kept a small sari-sari store to augment their seasonal income. Unfortunately, she couldn’t depend on these said ventures since she had minimal skill on sewing and her sari-sari store had limited items. SLP shed light on the aspiration of a mother to further her skills. In 2016, she grabbed the opportunity for skills upgrading and enrolled at Aparri Polytechnic Institute together with three SLP members from Buguey. The intervention capacitated her on the technical know-how on Dressmaking. It also provided Ms. Iris with physical asset as she received starter kit for the operation of her enterprise. She earns an average of P400.00 a day on sewing and repair services on a regular basis. On peak days, she earns as much as P700 a day. This venture translates to a monthly additional income of P13, 200.00 for the family. On days were demand is high, she hires seasonal workers and provides them a percentage basis income. She employs at most three mothers from her neighborhood. At present, through the gains from her sewing business, Ms. Iris was able to diversify the sources of her income. She was able to expand her sari-sari store to include a purified water refill, bottled drinks and a loading station. She also acquired one unit of freezer for her sari-sari store. Moreover, she also ventured on hog raising. Her hardships on her ventures paid off as she sees the fruits of her labor becoming a reality. The family was able to build their dream house. It may not be that big but it is now concrete, more comfortable and sturdy compared to the previous one. Greater than this economic gains, she finds fulfillment in being able to provide alternative income for other mothers like her. In her own little way her enterprise is making a difference to the community. 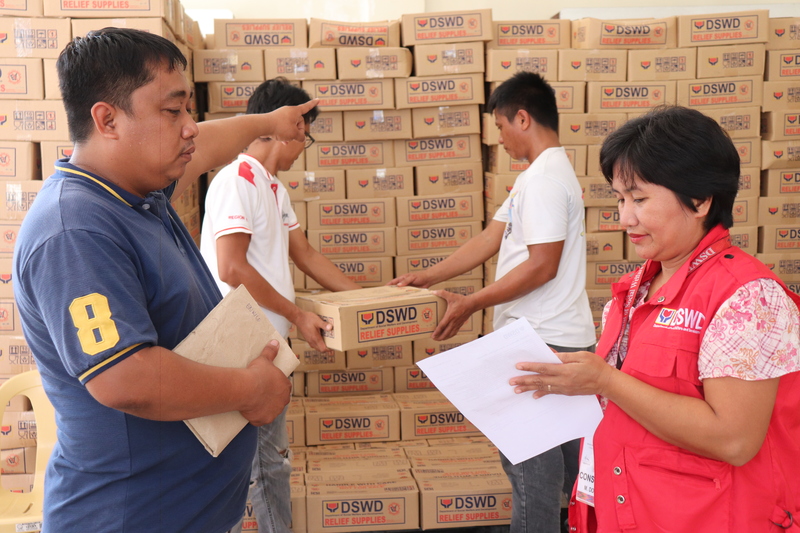 Cabarroguis, Quirino – Nagbahagi ng Family Food Packs ang Department of Social Welfare and Development Field Office 02 (DSWD FO2) sa mga residenteng nasalanta ng Bagyong Ompong sa Sitio Potia, Brgy. Dibibi. Sakay ng isang dump truck, matagumpay na nakarating ang Municipal Action Team (MAT) ng Cabarroguis kasama ang ilang opisyal ng lokal na pamahalan sa Sitio Potia. Ang naturang sitio ay isa sa mga itinuturing na Geographically Isolated and Disadvantaged Area (GIDA) na pinaninirahan ng mga Indigenous People (IP). “Agyaman kami ti adu sir, madam ta uray rabiin ken madama bagyo ket niranta da kami nga inikkan ti relief goods. Ti ammuk mabisinan kami tatta rabii ta han kami nakasagana (Kami ay nagpapasalamat na sinadya ninyo kami dito para bigyang ng relief goods. Ang alam namin magugutom kami ngayong gabi dahil hindi kami nakapaghanda),” pahayag ni Marites F. Miguel, isa sa mga residente ng Sitio Potia. Bagaman gabi na at malakas ang buhos ng ulan, hindi ito inalintana ng mga field staff ng DSWD upang mapuntahan at mahatiran ng tulong ang mga residenteng nasalanta ng bagyo. “Matatawag itong serbisyong publiko kung isasantabi mo ang kapakanan ng iyong pamilya para sa ikakabuti ng mga mas nangangailangang mga tao. Sakripisyong hindi matatawaran sa mga ngiting naidudulot nito na sumisilay sa bawat taong naabutan ng mga tulong mo,” sabi ni Ruth L. Taccad, Social Welfare Assistant ng Pantawid Pamilyang Pilipino Program sa naturang lugar. “Ang mga ngiti at pasasalamat mula sa ating mga benepisyaryo na napagsilbihan natin ay nagbibigay ng hindi maipaliwanag na kasiyahan na tanging mga lingkod bayan lamang ang makakaramdam,” dagdag pa nito. Time check, September 13, 2018, 7:00 PM. Murmurs turn into loud noises as field office staff struggle to keep things in check for the start of the disaster duty for Typhoon Ompong. People in the field office have been doing this for quite some time but there is an air of difference this time around. Learnings from previous disaster experiences have made staff hyper-alert about what to do and how to get things done. No longer are they clueless about how to approach things, they seem to know what to do. But knowing what to do and actually doing it are quite different, just as promising things is different and much easier to do than living up to your promises. But then again, this is disaster duty, and people in the field office are required to live up to their words because people’s safety is at stake. In the middle of all of this is Constancia Domingo of the Disaster Response and Management Division (DRMD). The diminutive lady with an iron will was tasked to consolidate the reports coming from the different Social Welfare and Development (SWAD) offices regarding pre-emptive evacuations and the like. The typhoon started battering through structures, and in the process, destroying the newly-built warehouse and multi-purpose gym of the field office. The main building’s third floor wasn’t spared either. The ceiling collapsed under the pressure of the searing winds. Soon thereafter, electricity was shut. No longer did Ms. Domingo have the means to communicate to people from the satellite offices to consolidate data. “Mahirap noong oras na iyon kasi nawalan ng kuryente. Mahirap kumuha ng data at wala ring paraan para magpadala ng impormasyon sa taas (central office),” Ms. Domingo said. But she couldn’t sleep too because someone had to man the Quick Response Team (QRT) that night. She thought that maybe the winds would die down soon so she could continue consolidating reports for submission afterwards but it didn’t. The winds continued pounding the building like there’s no tomorrow. It became horrifying. Ms. Domingo started thinking about the safety of her little kid and husband whom she had to leave that night so she could report to the office. Her husband wasn’t feeling alright too. He was earlier diagnosed with a heart condition that needs to be operated as soon as possible. She thought about leaving the office to check on them but the winds and the threat of debris falling on her were too dangerous to ignore. She couldn’t call or text them too. The problems continued piling on. But just like a soldier who continues to march on despite the obvious danger, Ms. Domingo soldiered on with her task. She prayed and gave everything up to her God. The winds were no more and the people in the field office were allowed to go outside to check the remnants of Ompong. The destruction was apparent and Ms. Domingo couldn’t believe what she saw. Buildings, trees, posts and houses were devastated. Some roads were blocked by debris. There were blots of flooded areas and ruined rice and corn fields. She thought of the people who were affected. She had a moment of grief, and at the same time, a very strong urge to immediately respond to their needs. Despite the traumatic evening, service is passion for Ms. Domingo, so she continued doing her job with vigor – coordinating with people, consolidating reports and the like. She says that no amount of money can compensate the fulfillment she gets from being able to serve the marginalized. “Humuhugot tayo ng lakas sa mga taong tinutulungan natin. Hindi naman kalakihan ang sahod sa ginagawa natin pero ang pagtupad sa ating tungkulin at ang pasasalamat na natatanggap natin sa ating mga natutulungan ay sapat na,” Ms. Domingo said. Penablanca, Cagayan – To ensure the timely delivery of assistance to families with damaged houses caused by Typhoon Ompong, the Department of Social Welfare and Development Field Office 02 (DSWD FO2) organized an emergency meeting with Local Social Welfare and Development Officers (LSWDOs) throughout the region last September 21, 2018 at Valley Hotel. The meeting comes a day after the completion of the report on the damaged houses and affected families caused by the typhoon throughout the region. The meeting was also done to elicit comments and suggestions coming from LSWDOs regarding the conduct of disaster response in their respective places as well as to come up with a response plan for the damaged houses in their areas. OIC-Regional Director Lucia S. Alan presided over the meeting, reiterating the importance of close coordination and cooperation between the field office and LSWDOs to provide immediate intervention to affected families. “I commend you (LGUs) for being proactive in your disaster-preparation and response activities. Let us continue our efforts to build resilience among our constituents,” OIC-Alan added. Mr. Rommel Gamiao of the field office’s Disaster Response and Management Division (DRMD) also discussed the disaster-related programs and services of DSWD such as Cash-for-Work (CFW) and Emergency Shelter Cash Assistance Project (ESCAP). Tuguegarao City – The Department of Social Welfare and Development Field Office 02 (DSWD FO2) led the Cagayan Valley Regional Disaster Risk Reduction and Management Council (CV-RDRRMC) Response Cluster Meeting for Typhoon Ompong today, September 22, 2018, to tap the assistance of various line agencies and local government units to synchronize their response efforts and come up with unified reports that are accurate and up-to-date. The meeting was also done to provide technical assistance to Provincial Disaster Risk Reduction and Management Officers (PDRRMO) and Municipal Disaster Risk Reduction and Management Officers (MDRRMO) in the conduct of assessment of damaged houses throughout the region and to minimize, if not completely eliminate, concerns from constituents on the veracity of assessments made by the former. OIC Regional Director Lucia Alan presided over the meeting where she reiterated complete staff work over the conduct of the response endeavour. “There is a need for us (agencies and LGUs) to work together so we can assist the affected individuals and families and try to work together to come up with a unified guideline in the checking of damaged houses throughout the region,” OIC Alan said.